As part of the summary script I use the following code to get the SharePoint 2010 version. This identifies which CU or Service Pack has been installed. This command outputs the same values as get-spfarm. Use .tostring() to get the version as string. Actually your code doesn’t work complaining about “the term get-spfarm is not recognized”. You will need to add that line of code if you are not using the SharePoint Management Shell. 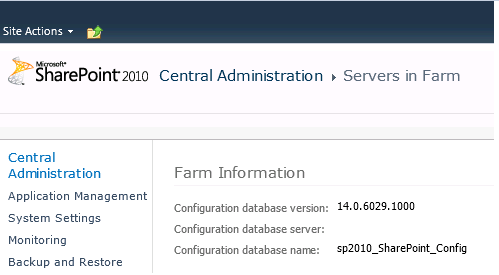 In some rare occasions the farm might not yet be configured (i.e. you’re just configuring it).